You don’t go to Koh Kood for long and hard partying but rather for experiencing one of Thailand’s last unspoiled islands. With a population of only about 2,000 people, this is actually the district (amphoe) with the lowest population of the country. This means the infrastructure here is more than basic, there is no public transport, you either hook up with a local Thai or rent a motorcycle to get around. There are no 7-Elevens and pharmacies, so if you want to buy something you will have to look for some small and basic convenience store run privately by a local Thai, or in most cases your guesthouse or hotel also has a small shop where you can get the most necessary items. Due to its remoteness there are also far few travelers making their way to the eastern-most island in Thailand, most of the tourists in the region stick with Koh Chang or do a day trip to Koh Mak. I was glad I did come there last month and spent some of my most relaxing days in Thailand – on some of the country’s most beautiful and unspoiled beaches. While everything is going easy during daytime as soon as the sun sets you are going to ask yourself: What am I gonna do now? This applies especially when coming there alone in the hope to make friends with new people on Koh Kood. Fortunately I decided to stay at the one and only beach on Koh Kood that has at least some nightlife: Hat Klong Jao. The Peter Pan Resort is not just one of the most luxurious hotels on the island, it also has the prime location right behind this beautiful beach. There is an outdoor restaurant as well as a beach bar and given it’s one of the most exclusive resorts on the island, the prices are still very reasonable, i.e. beers 90 Baht and cocktails 220 Baht. 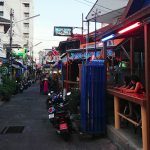 What surprised me about this place is that there were barely foreigners hanging out but many of groups of young Thai people including lots few pretty hot girls. All of them wealthy without a doubt, it almost felt like in the beer garden in Thong Lor, Bangkok. Look at the video, typical scene in Hi-So Thailand: The guy proud of his girlfriend and trying to give her a good time, the group of boys and girls that don’t really have a plan what to do and so randomly painting their faces, taking pictures while sipping cocktails. And then the lesbian couple with the beautiful chick and her Tom boyfriend. Right next to the beach bar there is a fire show held every other night at 8pm (free, tips appreciated), really impressive check out the video below. 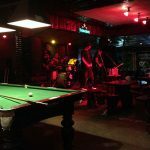 Apart from the nightlife on Had Klong Jao there isn’t really much going on on Koh Kood after sunset, however most guesthouses and hotels usually have a cosy restaurant that make great drinking spots too.